The feeling of it to my lungs was not sensibly different from that of common air; but I fancied that my breast felt peculiarly light and easy for some time afterwards. Who can tell but that, in time, this pure air may become a fashionable article in luxury. Hitherto only two mice and myself have had the privilege of breathing it. Experiments and Observations on Different Kinds of Air (1775), Vol. 2, 102. 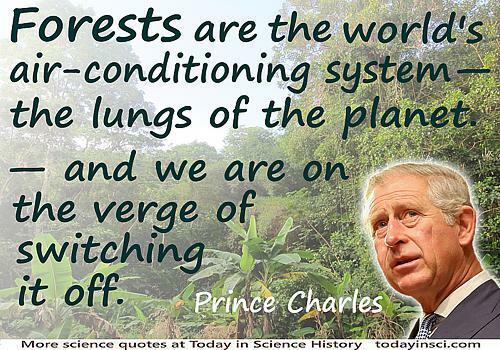 The forests are the “lungs" of our land, purifying the air and giving fresh strength to our people. From 'A Presidential Statement on Receipt of the Award of the Schlich Forestry Medal' (29 Jan 1935) in Public Papers of the Presidents of the United States: F.D. Roosevelt, 1935, Volume 4 (1938), 65. Roosevelt was awarded the medal by the Society of American Foresters. This is seen in a number of sources incorrectly joined with Roosevelt’s quote about the nation destroying is soil (q.v. ), but Webmaster has only been able to find primary sources for these as separate quotes.